Our product range includes a wide range of customized sliding bath cabin, steam sauna bathtub, steam sauna unit, wooden sauna bath, sliding square and round steam bath cabin and woman steam sauna bath. Low water level cut off to ensure heater safety. Electrical controller have temperature sensor. Soothes mind & Body to relieve stress & relax muscle. Grade “A” Spruce Boards FC Interior walls, ceiling and flooring. Finish Series Heater with Lava Rocks. Trim For Corners and Ceiling. Hermetically Sealed, Tempered Safety Glass and Hardware. Vapor proof Wall Light Fixture. Improve circulation can lead to lowered blood pressure and a healthier heart. Healing of broken skin tissue. It can help lower high blood pressure. Kids with respiratory infection recovered more quickly after steam therapy. 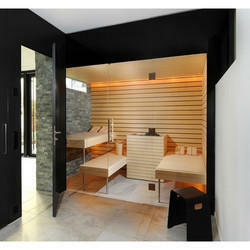 Saunas bring about recreational and social benefits. 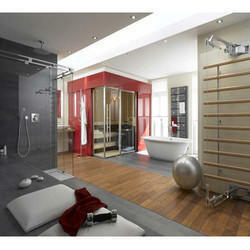 Saunas relax muscles and soothe aches/pains in both muscles and joints. Saunas can induce a deeper sleep.